January 17th 2011, was the unveiling of the artwork PIXINESS by the by the visual artist Axel Morgenthaler at the SAT. The event marked the beginning of a year-long series of events and festivities that will highlight the fifteenth anniversary of the Society for Arts and Technology [SAT]. Starting today, PIXINESS will illuminate St. Laurent Boulevard when it makes its debut as the facade for the new SAT building. This permanent artistic oeuvre commissioned by the SAT is a prototype conceived by the internationally reknown visual artist Axel Morgenthaler and is part of the Quartier des Spectacles Luminous Pathway. This large scale interactive motorized lighting and digital media artwork measuring 3.6 metres high by 18 meters long, PIXINESS is made up of 12 motorized prisms displaying a mirrored surface on one side and a luminous interface of giant, dome-shaped pixels on the other. This huge ensemble of motorized lights, weighing a total of 2 tons, will generate visual content using a matrix of 960 interactive LED pixels. The horizontal rotation of these prisms will create reflections of the external evironment or produce layers of low-resolution, light-based images that lie at the limits of our figurative perceptions. The rotation of this artistic work will create a dynamic link between the interior and exterior of the new SAT building. Combining architectural art, light art, and interactivity, PIXINESS is a one-of-a-kind intelligent lighting installation. This monumental digital playground will offer several levels of sensory experience and interaction : passersby and night owls will be invited to observed its endless permutations or to interact with the artwork, sending it commands and transforming its content via their iPhones. A first game, RIPPLES, is now available : turn your iPhone in horizontal position and move the cursor to create some ligthing waves in the artwork. Try several rates and directions ! 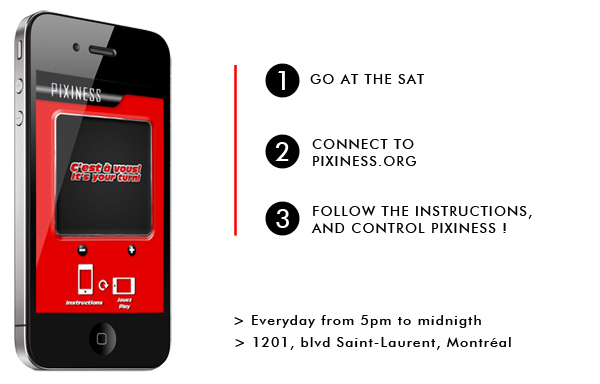 The next one, PIXIMON, will be launched in the context of the Nuit blanche, February 26th 2011. 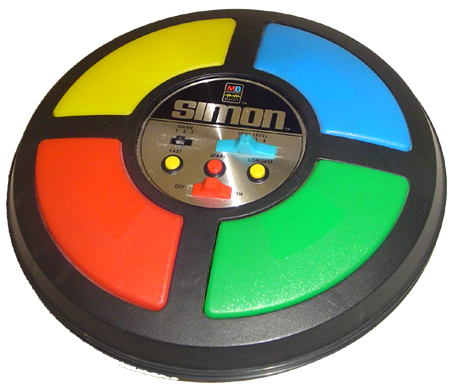 Inspired by the game Simon, where the gamers have to recreate a sery of colours and sounds pressing on the good buttons of the machine. PIXIMON allows to recreate the sound and ligth sequences issued by PIXINESS, and you can face your friends ! Frédéric Bove, Mikaël Charpin, Luc Laporte, Laura Jeanne Lefave, Félix Martel, Pascal Proulx, Julie René, Serge Vézina, Monique Savoie and the entire team at SAT. The production of PIXINESS required two years of reseach and development and was supported entirely by Quebecois specialists and expertise. This production has been made possible through the support of the Quartier des Spectacles Partnership and the Canada Council for the Arts.